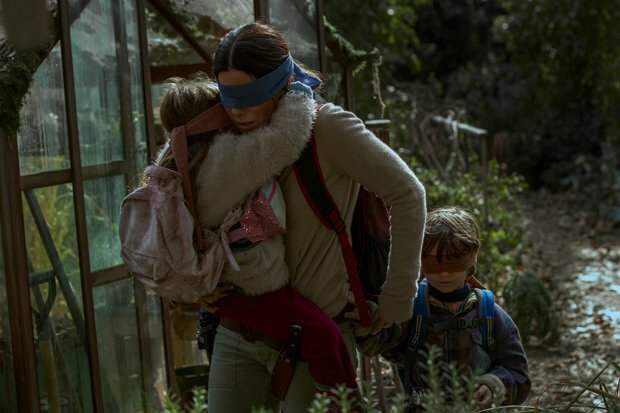 Parenting has never seemed so stressful as in dystopian drama Bird Box; day-to-day childrearing challenges become a mere trifle as we watch Sandra Bullock's survivalist cajole two kids through the apocalypse… whilst wearing a blindfold. Danish director Susanne Bier follows her Emmy-winning work in The Night Manager with a feature that, despite the pluck of its leading lady, can be hokey as hell, particularly in its tendency to borrow from M Night Shyamalan's playbook. Switching between a world gone psychotic and her family's desperate quest for sanctuary five years later, Bullock's artist Malorie is heavily pregnant when she witnesses the death of her sister Jessica (Sarah Paulson) – just one of a wave of mysterious suicides that sweep the nation. Shellshocked, Malorie finds refuge in a house filled with familiar, likely doomed, faces (John Malkovich, Jacki Weaver, Moonlight's Trevante Rhodes). Those succumbing to the sudden, irrepressible desire to take their own lives do so after experiencing a supernatural phenomenon; to avoid the same fate, those that remain resort to covering their eyes. If Bird Box – based on the novel by Josh Malerman, with a screenplay from Oscar nominee Eric Heisserer (Arrival) – is practically a twin of Shyamalan's The Happening, it's also the awkward, tonally confused cousin of taut horror A Quiet Place. Despite being frequently derivative, there are moments here which, however much Bullock's tough mudder might convince us otherwise, still feel odd – a double birth chief amongst them. Other scenes – an ingenious use of sat nav, a devilish Tom Hollander – are nail-biting enough, while cinematographer Salvatore Totino (Everest, Spider-Man Homecoming) lends the doom and gloom some welcome polish. As chaos descends and burnt-out vehicles and bodies pile up in the street, Bullock gives her worried looks a workout and, in doing so, manages to steer this well clear of the car crash it might have been. Available to watch on Netflix from Fri 21 Dec.
Malorie (Bullock) has to protect her children against a monster that can drive people mad if they see it, so she wears a blindfold. Awkward, tonally confused cousin of A Quiet Place, but it has some ingenious moments and Bullock manages to steer it well clear of being a car crash.